Editors Note: This marks the first appearance of a new, recurring treat for our readers. ABS will reach out and do a “Lightning Round” of just a few questions with all manner of artists, from well known icons to up-and-coming performers of note. We hope you enjoy it! Eve Monsees is a staple around Austin, TX where she has lived since she was eight. She grew up just a few doors down from her friend and brother since childhood, Gary Clark Jr. They shared licks in garages all through school, and still stay in touch. In fact, Clark invited her to join him in playing at the Austin City Limits Hall of Fame induction ceremony, on October 12th. What a great birthday gift for Monsees! 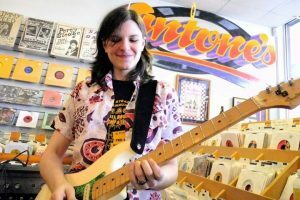 She is also well known in Austin as the co-owner of world famous Antone’s Record Shop, along with husband Mike Buck. Barry Kerzner for ABS: What was the first song you learned on the guitar? The first song I really remember learning is “Starry Eyes” by Rocky Erickson. I think that’s the first real song I learned. Yeah. I got an acoustic Fender guitar – I think when I was 11. Then when I was 12, I got my first electric guitar, which was a Fender Stratocaster. The first time I played on stage was at the Hole In The Wall in Austin, when I was 14, with my guitar teacher; I kind of sat in with him. The first blues gig was with Gary when on my 15th birthday, downtown at a place called Babes (now called “Friends”) for a blues jam. We got up and played on that, but prior to that, I’d sat in with my guitar teacher’s band, a punk band called the Soul Benders. What has been the worst experience you’ve had performing? I’ve been pretty fortunate for the most part. So, has your best show experience been this week, playing with Gary Clark Jr. at ACL HOF Induction ceremony? Yes! This was pretty amazing, the ACL Hall of Fame thing! The best way to describe it is like you tell somebody, ‘Man, I had this crazy dream the other night. It was my birthday and I was on Austin City Limits and Willie Nelson was there.’ I mean, it’s so unbelievable to me that that convergence occurred and I got to be in the middle of it. What is the one thing that you most want to accomplish with your music? I want to feel like what I do is appreciated and also because it’s blues, just the idea of helping carry on that tradition. So, it’s not about making a ton of money, or being famous, or anything like that. It’s more of just like, knowing what you’re doing is appreciated, and that in some small part I’m helping carry on something that has been passed down I guess. What advice would you give players coming up now? Listen to a lot of old records, I guess. Yeah, listen. Don’t just try to play for the sake of playing. Be aware of what’s going on around you, and do your homework.